Relax at the campsite while keeping a cold drink handy with the Coleman Cooler Quad Portable Camping Chair. 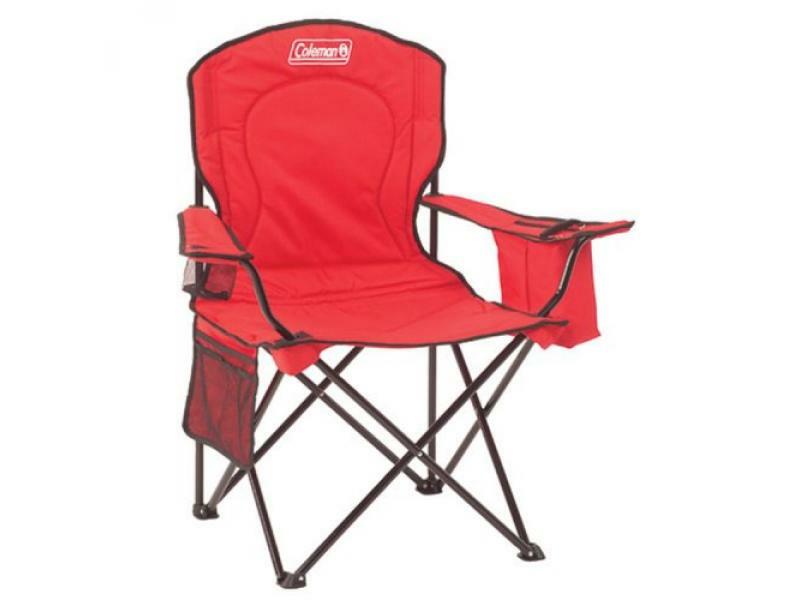 Relax at the campsite while keeping a cold drink handy with the Coleman Cooler Quad Portable Camping Chair. This folding chair comes equipped with a built-in cooler pocket that keeps up to four cans of your favorite beverage cool, so you can grab a refreshing drink without getting up from your seat. With its adjustable arms and fully cushioned seat and back, the chair is built to provide support and comfort. A mesh cup holder offers easy access to a drink, while a side pocket allows you to keep books, magazines, and other personal items within reach. Durably constructed from heavy-duty steel, the chairs frame can support up to 325 pounds. The collapsible camping chair easily slips into the included carrying bag for easy portability.